A while ago I was glancing through Pinterest (as you do) when I came across this pattern called Scrappy Susannah Seemed like a good one to me, especially when I realised I could do as many blocks as I felt like to create a baby quilt. 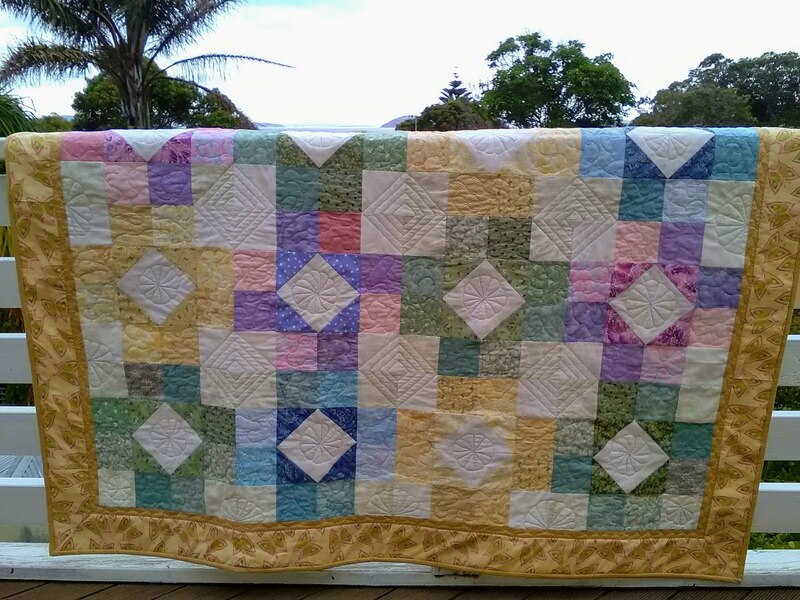 While the four I have done to this point have been pretty bright, primary type colours and quite bold, see first, second, third and fourth, this number five cot quilt is more sedate, low volume, call it what you will, but to me it seems like old fashioned. Maybe its the fabrics or the combination with the pattern, but I enjoyed finding scraps and seeing it come together quite quickly from the large blocks. And wouldn't you know it, from the fabrics I brought down I found the border fabric with its green butterflies edged in pink that seemed to fit the feel of the quilt really well. Below is a close up of the point where the two blocks connect, with the green and mauve. I'm grateful to one of my clever friends for showing me once how she loves the reverse of some fabrics. 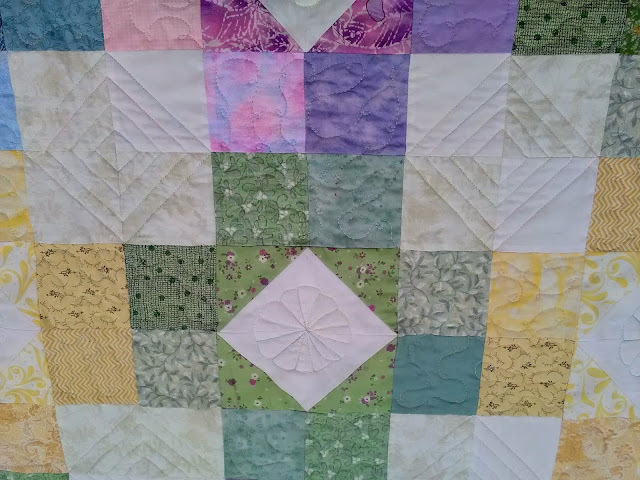 The green floral on the bottom corner left of the mauve/green junction is one where I originally had it on its 'front' side and it seemed too loud for the block. Being limited in my choices (being away from home at our holiday place and a twenty minute drive to the fabric shop where I'd probably been too often anyway for this trip!) I flipped it over and it seemed to fit in far better. 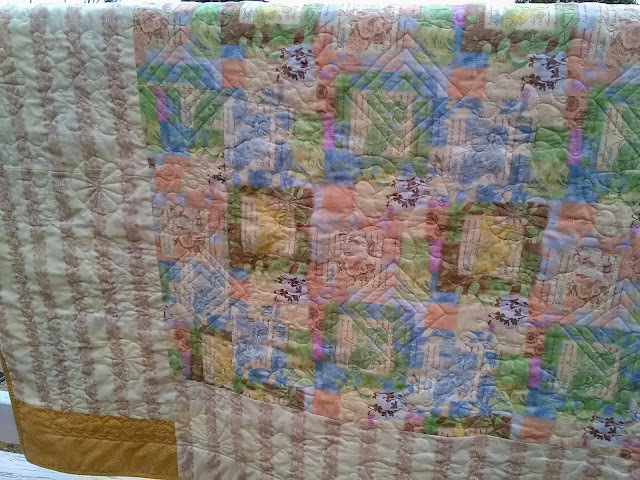 And for the backing, again I searched through my limited basket and found a piece I've had for several years and I'd brought it for its pastel type colouring that I thought might suit a baby quilt in some form. Of course there wasn't sufficient so I needed to add borders, but I was quite happy with the stripe that comes from a Victoria & Albert collection, which also seemed to suit the old fashioned feel. The small gold rectangle in the corner is of course the 'extra' bit I needed but it does pick up the first inner border and binding from the front so I'm OK with it. 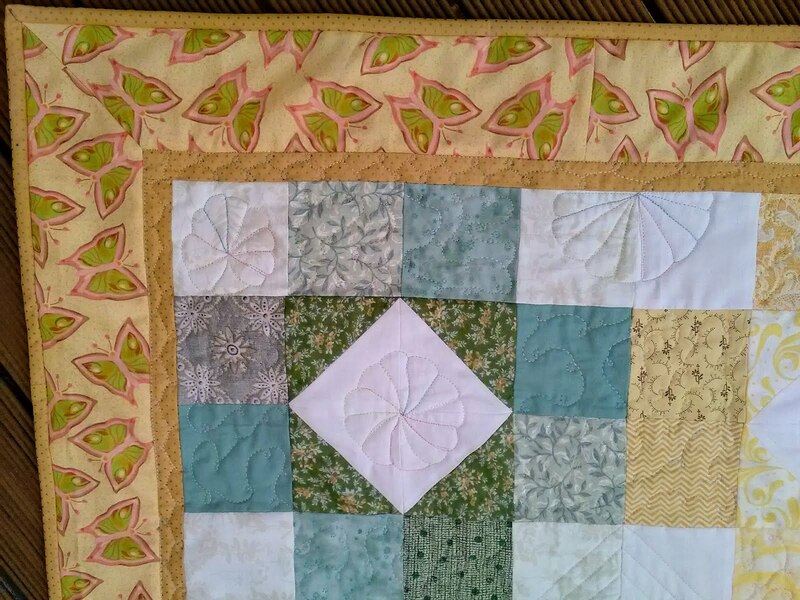 You can also see the square quilting and small loops I did in the non negative spaces (or white and cream). Using a variegated thread means that the squares and the 'mandarin segments' as my supportive other half calls them show up with a lovely changing colour. Since a friend of mine recently had a 'great niece' I think this one will come out of the six I'm aiming at for our Mothers of Pre-Schoolers group - and I'll just have to make another!! Quilt number six is sandwiched and ready to be quilted but as we sadly leave our lovely beach spot today it will have to wait until we get 'home' - though here has felt like home since I've been here since the week before Christmas. During that time we also had our youngest son's wedding, to his American fiancee. 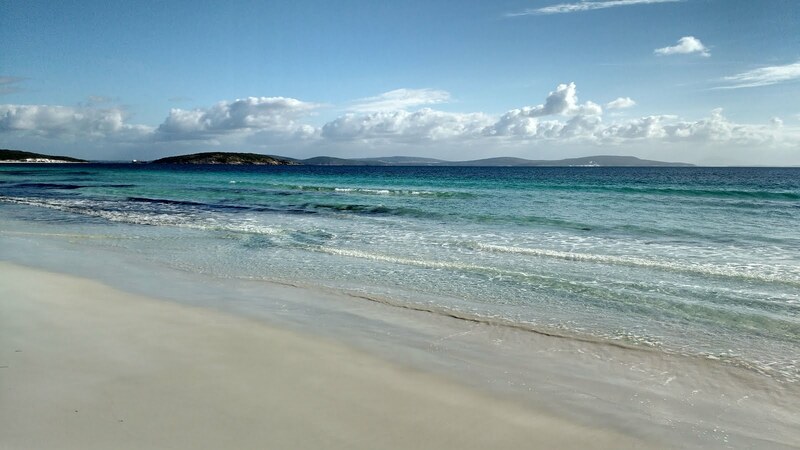 It was a beautiful day on the beach, rather like this. 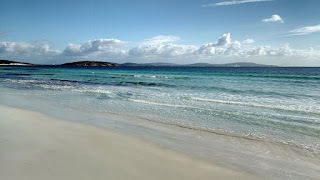 I hope to show you photos soon, but suffice to say everyone enjoyed it, even eldest son who managed to get some sunburn. But for now, we leave all this behind to return to routine and life as we currently know it. Having had an amazing Christmas and a wedding, truly unforgettable. Love the colors - just so pretty. I really like how you quilted it, too!